The Long Island Railroad first began its section of track beginning in Bedford Stuyvesant in the farmlands of rural Brooklyn. It was a steam powered line known as the Brooklyn and Jamaica Railroad on April 25, 1832. When completed on April 18, 1836, the LIRR leased it and began laying rails east of Jamaica reaching Hicksville by March 1837. By 1841, it reached Farmingdale, by 1842, it crossed Suffolk county and reached Deer Park. Later in 1844, it went to Medford, then Lake Ronkonkoma in 1848. Later, the South Side Railroad was built in 1860 from Jamaica to Patchogue. Other branches were built too like the Brooklyn & Rockaway Beach Railroad on October 1865 (part of today's train). 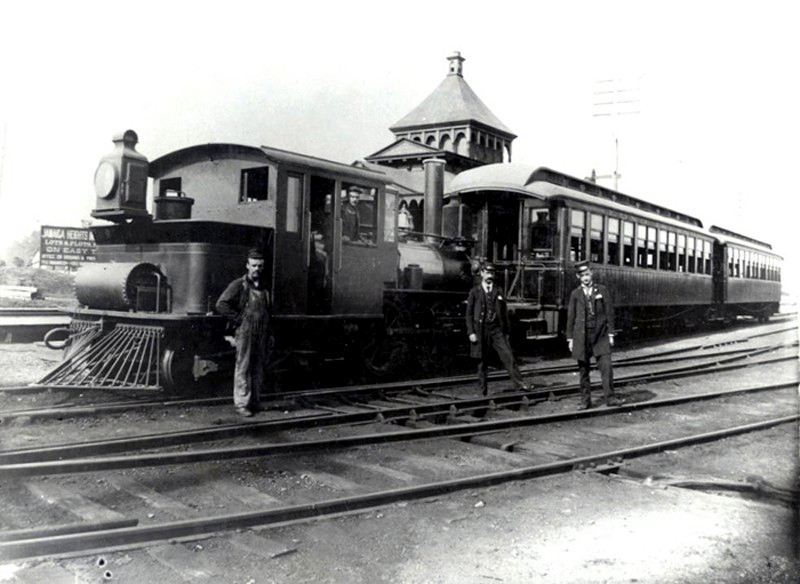 The Smithtown & Port Jefferson Railroad was built in 1873, and The New York & Long Beach Railroad was built in 1881. Gradually, the railroad kept going east into the 1880s until it reached Montauk on the south shore and Greenport on the north shore. There was an Atlantic Ave tunnel built in 1844 by the LIRR to relieve congestion in downtown Brooklyn. It was part of a rail network that brought passengers to Boston. But for political reasons, the line was closed in 1859. By 1861, the tunnel was sealed up never to be used again. The section of track nearest the New York & Sea Beach Railroad (part of today's train) and parallel to the Ave H section of Brooklyn was known as the New York & Hempstead Railroad (Bay Ridge Branch) and built in 1871. It began at 65st in Bay Ridge running through Midwood and into Queens until it reached Valley Stream. It ran at grade level in its early beginnings and was built primarily because the people of Hempstead were dissatisfied with the service the LIRR was providing over its branch to the main line at Mineola. Eventually, the New York & Hempstead Plains Railroad became part of the LIRR anyway. In the late 1870s into the 1900s, there were several instances when the LIRR was connected with existing elevated and rapid transit lines that would eventually become part of the New York City subway system. Similarly, rapid transit lines would run over the LIRR tracks as well. The first connection the LIRR made with the rapid transit system was in 1878. It was between the Brooklyn, Flatbush, and Coney Island Railroad (part of today's train) on the Franklyn shuttle allowing the LIRR to make a connection at Atlantic Ave and Franklyn Ave for freight and passenger service. The Brighton line used the LIRR Flatbush Ave terminal and the LIRR used the Brighton line for travels to Coney Island and points out east on Long Island to Montauk if it wanted. In 1880, a man named Austin Corbin owned the Manhattan Beach Railroad a few blocks away between today's East 17th and East 18th streets. He was a serious rival to the Brighton line so he bought the LIRR and stopped running LIRR trains along the Brighton since it was a direct competitor to his Manhattan Beach Railroad. The rapid transit part of the Brighton line continued to use Flatbush terminal until the expiration of the agreement in 1884. Another reason the agreement was terminated was because the LIRR wanted people to use its new line to Long Beach rather than go to Coney Island. The second connection the LIRR made with the rapid transit system was in 1885 between the Prospect Park & Coney Island Railroad (parts of today's train on the Culver line) to operate trains jointly on each others tracks. The connection was between the Bay Ridge line at Parkville (Ave I) and the Culver line where trains could switch onto the Culver either from the east or west. From 1893 - 1899, the LIRR actually owned the Culver line as part of the New York & Manhattan Beach Division. Since the founder, Andrew Culver was in bad health, he had to sell the Prospect Park & Coney Island Railroad to the LIRR. In 1895, a connection was made with the Fifth Ave el to allow Brooklyn Bridge passengers a direct route to Coney Island using both the Prospect Park & Coney Island Railroad and Manhattan Beach Railroad. The Norton's Point Railroad, a minor Coney Island branch from the Culver was also electrified during this time. By 1899, the Culver line, still on the surface, was electrified and LIRR passenger service ended because they were losing money. That's when it was sold to the Brooklyn Rapid Transit (BRT) on April 1, 1899. 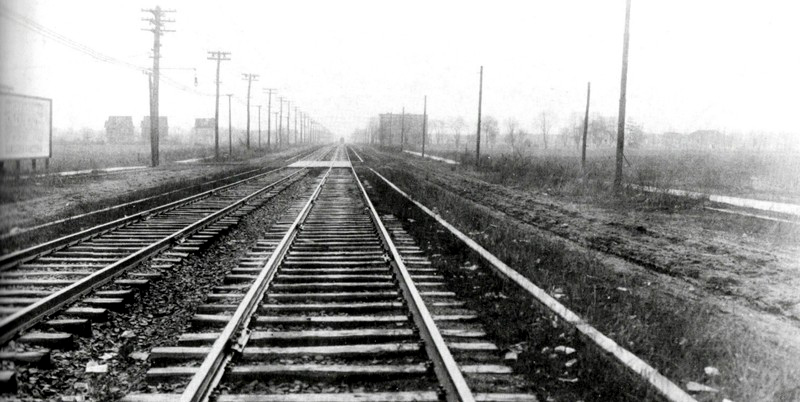 These surface tracks along McDonald Ave remained for a long while and were used for trolley services 1916 to 1956 and freight services from 1916 until the 1980s. 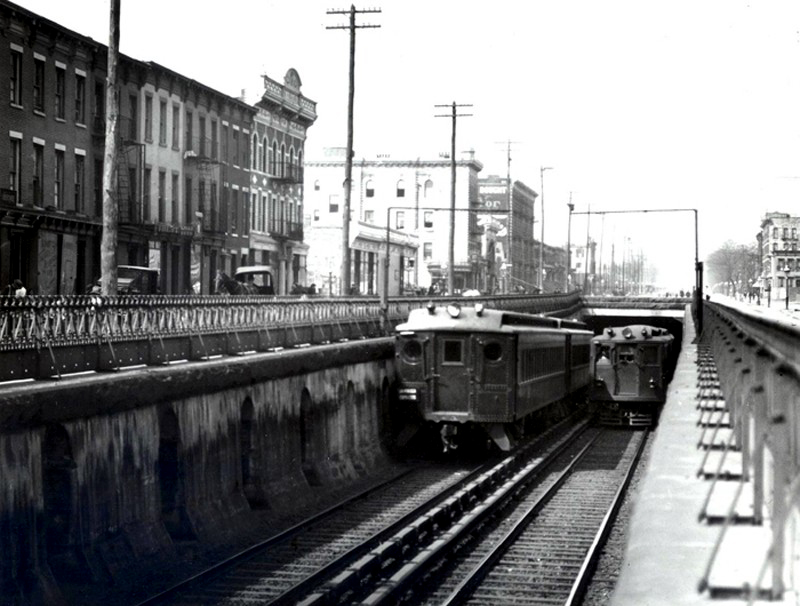 In 1919, the Culver line became an el just like its connector, the Fifth Ave el. A third connection with the LIRR took place even further from the mid 1890s to the 1900s. The LIRR entered the el structure near Flatbush Ave terminal, rode the el above Hudson Ave, switched onto the Myrtle Ave el (part of the former train) and terminated at Sands Street. From Sands, passengers transferred to the New York and Brooklyn Bridge Railway, crossed the Brooklyn Bridge one stop until it reached Park Row in Manhattan since 1940. From there, they were able to switch once again to the IRT City Hall Terminal of the Third Ave el from 1882 - 1953, additional transfers to the IRT subway , , trains since 1904, and access to the BMT Chambers street subway , former , and since 1913. Penn Station finally opened in 1911 for the current LIRR route. Brooklyn and Manhattan were two 'totally' separate cities from one another; which explains why their transit lines weren't unified like they are today. The fourth connection the LIRR made with the Brooklyn els was with the Broadway, Jamaica, and Fulton street els, today's , , and lines. The line went from a now vanished Williamsburg Terminal to the Rockaway Branch of the LIRR from 1898 - 1917. When Williamsburg Terminal was torn down, Chambers street terminal on the handled LIRR trains to the Rockaways August 4, 1913 - 1916. Today, the train is the only rapid transit line still connected with the Rockaways since the LIRR sold it to the subway system in 1956. In June of 1896, Austin Corbin died falling off a horse carriage. It was also the start of a slow death of his Manhattan Beach Railroad as a passenger service. 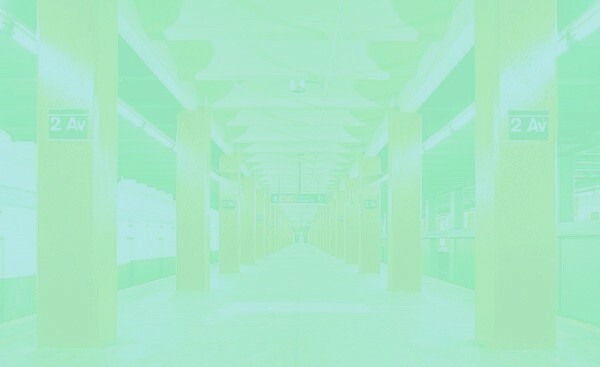 This occurred because the Brighton line (today's Franklyn shuttle ) connected with the Fulton st el (BMT #13). This connection cut into the Manhattan Beach Railroad's revenues. By the early 1900's, the Manhattan Beach Railroad went from a mainly passenger service to merely freight. From May 9, 1903 until May 1918, the LIRR chose to put the Bay Ridge branch underground from 65th street to East New York to eliminate grade crossings. In 1905, the LIRR Manhattan Beach Division got connecting services to Sheepshead Bay on the Brighton line while the Brighton was still a surface railroad. Later in 1918, the surface route of the Brighton was scrapped to make way for the current route which is elevated, today's and trains. Two additional tracks were built for the Manhattan Beach Division of the LIRR along the eastern side of the embankment. On January 17, 1918, a connection was made between the Bay Ridge branch and the NY Connecting Railroad over the Hell's Gate Bridge. On May 14, 1924, passenger service ended on the newly built Manhattan Beach section and Bay Ridge branches. From Ave J to Ave X on the eastern part of the Brighton line embankment, you can see where the LIRR tracks used to be since the structure once had six tracks. Now it's down to four. Freight service continued on the older Manhattan Beach surface railroad though until 1937. After 1937, the right of way was turned into resident's backyards between today's East 17th and East 18th streets. In 1927, The LIRR electrified the Bay Ridge branch using 11kv Ac power of the Pennsylvania and New Haven Roads rather than third rails. By 1969, the power wires came down from the Bay Ridge branch and was almost abandoned. Luckily, it's still in use for freight services by the New York and Atlantic Railway since 1997. It travels to eastern Long Island, across the Hell's Gate bridge with further connections to the Connecticut Railroads, Amtrack right of way to Boston, and other connections as far northwest as the land goes. Not bad for a line that begins on 65th street in Brooklyn! In time, the LIRR no longer needed to use the Brooklyn els for its trains; but further expansions would continue... The Jamaica el , and Myrtle Ave el became part of the subway system when they crossed the Williamsburg Bridge on September 16, 1908 and connected with the Nassau st loop. From 11/5/1888 - 6/12/1940, the Fifth Ave el (BMT #6) was the main artery to the Brooklyn els. It allowed them access to the tip of Manhattan when crossing the Brooklyn Bridge, but not much further than Park Row. It was later on June 22, 1915 when the Fourth Ave subway from Bay Ridge was built to bring the other Brooklyn lines over the Manhattan bridge and Montegue street tunnel instead. It lead them to Broadway in the heart of Manhattan. Thus, the Fourth Ave subway extended the Sea Beach line on June 22, 1915, the West End line on June 24, 1916, the Brighton line , on August 1, 1920, the Culver line in May, 1931, and the Astoria el , on October 17, 1949 to take the place of the Second Ave el which was abandoned June 12, 1940. The Culver line lost its track connections to the Fifth Ave el in 1940 and Fourth Ave subway in 1975 when two stations were abandoned northwest of Ditmas Ave. Once the city amalgamated into the five boros in 1898, many of the train lines merged together to become a more unified system. On September 10, 1932, the Independent (IND) opened its Eighth Ave subway train from Hudson terminal (World Trade Center) to 207th street in Washington Heights. The began service that same day from (World Trade Center) to 168st. On July 1, 1933, the first began service from Jay to 205th street the Bronx, the went from Queens Plaza to Roosevelt Ave beginning Aug 19, 1933, the (GG) went from Queens Plaza to Nassau Ave that same day, and the went from Court street (Transit Museum) to Hoyt Schermerhorn on April 9, 1936. Once the Sixth Ave subway opened on December 15, 1940, the (BB) went from 34th st to 168th st, the went from (World Trade Center) to 205th street the Bronx, and the went from (World Trade Center) to Parsons Blvd. Because of the Independent (IND), the Fulton st el (BMT #13) was mostly abandoned in 1940 but the small parts they kept became part of the train on April 29, 1956. Other Brooklyn els were abandoned altogether like the Third and Fifth Ave el (BMT #6), Lexington Ave el (BMT #12), parts of the Myrtle Ave el , and most of the Park Ave el , . The Third Ave el became part of the Gowanus Expressway for vehicular traffic shortly after 1940. We also lost the (IRT) Second, Third, Sixth, and Ninth Ave els in Manhattan because of the Independent. Additionally, the (IND) had its eye on the Culver el since 1934. Twenty years later, a ramp was built to join Church Ave with Ditmas Ave on December 30, 1954. It extended the train from 205th street the Bronx to Coney Island along the Culver route. On December 5, 1955, a small connection was made between the 60st tunnel and Queens Blvd line allowing the (BMT) Broadway subway access to the (IND) tracks in Queens. This is the route the current train uses to get to Queens. On November 26, 1967, a major tunnel known as the Chrystie street connection was opened further joining the (IND) tracks with the (BMT). From this connection, the and started using the Manhattan bridge to absorb the Brighton and West End els in Brooklyn. The started operating from 179st Queens to Coney Island via the Culver el using an additional Rutgers street tunnel to Brooklyn that same day. The Chrystie street connection also allowed the Jamaica el access to the IND Sixth Ave subway but was phased out in 1976. It did, however, re-open once again for the new service to the Sixth Ave and Queens Blvd subways on 6/25/2010. Despite the IND takeover, the original BMT connections still exist too like the Broadway subway Brighton and Sea Beach leading to Brooklyn via the Manhattan bridge, Fourth Ave subway via the Montegue street tunnel, the Canarsie leading straight to 8th Ave via the 14st tunnel, the Astoria el , using the 60st tunnel, the Franklyn Ave shuttle using a remnant of the BMT tracks, the Jamaica el , , and Myrtle el crossing the Williamsburg bridge to the Nassau street loop via lower Manhattan. 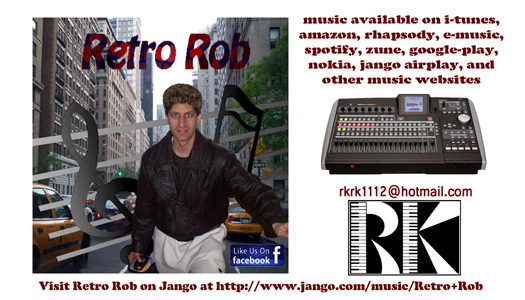 The only boro still not connected to the rest of the city by train is Staten Island but that can easily change too if wanted. The Staten Island Railway can either cross the Verrazano bridge or tunnel under the Narrows to meet with the Fourth Ave subway in Bay Ridge. Other lines still possible are the Second Ave subway which can be incorporated with a possible Staten Island connection. Even the World Trade Center site can be part of this track arrangement from Staten Island straight into the tip of Manhattan as an express route into the city. Only time will tell what eventually takes place but it should be interesting.